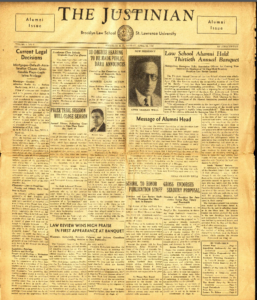 Brooklyn Law School recently digitized and made accessible its collection of Brooklyn Law School’s student run newspaper, The Justinian. The digitized collection is available on Brooklyn Law School’s digital repository, BrooklynWorks . 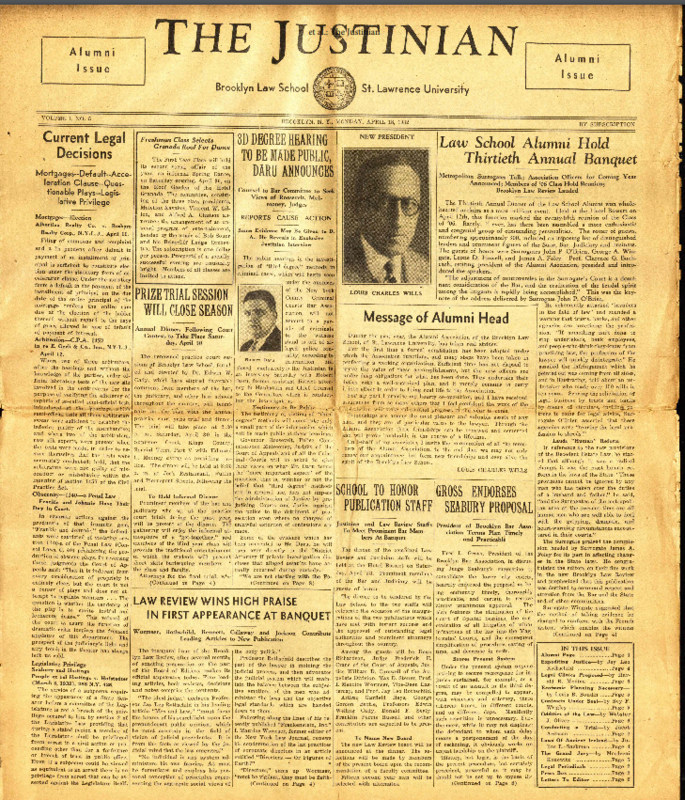 The BLS student-run periodical program began in 1918 as The Barrister. It was published monthly until 1922. Almost a decade later, in 1931, the periodical’s title changed to The Justinian. Publication continued until 1998. The Justinian was not produced from May 1945 to September 1954. After 1998, it was referred to as Brooklyn Law School News, which ran from 2002 to 2006. The Brooklyn Law School Library Archives provides digitized versions of this printed collection from April 1932 to October 2006. The content has complete OCR text recognition for all 238 issues. The periodicals were published monthly. For most April issues, there is a special for April Fool’s Day. For 88 years, these news-sources have been accurate portrayals of political, social, economic, and local topics that have interested Brooklyn Law School students and engaged them in active involvement and debate. Written by: Kathy Darvil on March 9, 2018. This entry was posted in Access, Alumni, BLS Students on March 9, 2018 by Kathy Darvil.